It’s Christmas morning and there are a hundred reasons to see life through a greyscale filter. I want to be home right now, with my brothers and my little sister, sitting around joking with our parents, interrupting the unrestrained conversation to bring chocolates to the table, complaining about how mother’s peppersoup always runs out way too fast. I want to hear my little sister ask for everything, from money to my cologne to whether she can bring me more food. I want to say no at first, so she can look at me in that unconscious way she looks at me when she wants something I won’t give, as if to say, ‘but I’m your little love, how can you say no?’. I want to go visit grandma, with her house full of uncles, and aunts, and cousins, and church members, and haters. I want to hug her, and steal her away for a few minutes because I’m still her favorite. I want to wander through her farm, and get the boys to harvest fresh yams to roast over a wood fire, served with palm oil and sprinkled salt. I want to walk down the winding path to the stream, and skip stones, and get lost in the orchard at the back of her house. I want everything but the mournful haze that has settled over my dawn thoughts. There are a hundred reasons to see life through a greyscale filter, but I’d rather count my blessings, no matter how small or how few. I have realized that sometimes, I sit around waiting for the big blessings, praying for the earthmoving miracles, mind shut to the realization that the big blessings are an aggregation of the invisible small things. It’s like how nothing seems to change and every day seems the same until, one day, you look back at your life and you see how an awful lot has changed. It’s the small things that add up. So for today, although I have neither presents nor a home-cooked Christmas dinner, I am thankful for all my overlooked blessings, like the soldiers dying to keep us all safe, or the hearts far away that worry for me, for friends who may stick closer than siblings, for the ability to afford a quiet lunch, for the stranger who let her little son accept my present in a city as distrustful as Lagos, and I am thankful for the little boy’s smile. He told me his name and shook my hand, and in that moment, I think that Christmas was made for me. It’s a blessing to be alive, here in this vast, half-empty city, far away from the conversations with my brothers and little sister, and from mother’s peppersoup, and grandma’s orchard, and uncles and aunts, and cousins, and roasted yam sprinkled with salt and served on ceramic plates. It’s a blessing that I can call this city home, because home is wherever you feel loved. I have been blessed by by the friendships and the affinity of people who were once strangers; people who love me in spite of me, who make paradise possible in this hell called Lagos. 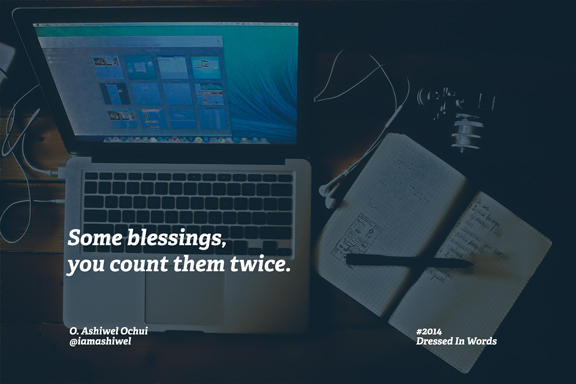 And I don’t say it often, but when I count my blessings, I count them twice. Nice one. Merry Christmas sweets.